After fighting in two Pacific Theater Campaigns during World War II, the 32nd Antiaircraft Artillery Brigade was inactivated from 1947 to 1951. 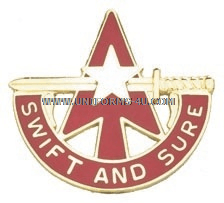 Reactivated in England and redesignated as the 32nd Artillery Brigade in 1958, the unit deployed to Germany during the 1960s, and in 1966 it was redesignated the 32nd Army Air Defense Command (ARADCOM) and was attached to U.S. Army Europe (USAREUR). Armed initially with Nike (Hercules and Ajax) and HAWK (Homing All the Way Killer) missiles, the brigade began receiving Patriot missile batteries in the 1980s. While the primary task of higher-level air defense during Operation Desert Storm was given to the 11th Air Defense Artillery Brigade, which deployed from Fort Bliss, several brigades from the 32nd ARADCOM provided a significant number of Patriot batteries that proved crucial in defending both ground forces and installations from SCUD missile attacks. Inactivated in 1995, the unit was reactivated in 1998 with its current designation: the 32nd Army Air Defense and Missile Command. Almost immediately it deployed to Kuwait as part of Operation Desert Thunder, where it helped establish and implement air and missile defense procedures for forces with both U.S. and Kuwaiti forces. Elements of the 32nd also aided in the development of an early warning system for incoming missiles that might carry biological or chemical payloads. The 32nd AAMDC’s Distinctive Unit Insignia, or Unit Crest, features a five-pointed star in its center; the points represent the unit’s participation in the campaigns of St. Mihiel and Meuse-Argonne during World War I and New Guinea and Leyte during World War II. The fifth point symbolizes its Philippine Presidential Unit Citation. (Among the unit’s other decorations are two Army Superior Unit Awards and a Meritorious Unit Citation.) A vertical arrow represents the speed of the command’s weaponry, while the horizontal unsheathed sword represents combat readiness. If you are purchasing the 32nd AAMDC's Unit Crest, you likely will be interested in our pages devoted to the unit's Combat Service Identification Badge (CSIB) and shoulder sleeve insignia.